Month of Madness: Train to gain by Jordan Charles Oberdries. Hi. My name is Jordan Oberdries. I am 23 years old and I am a dancer. Right, now we’ve got the necessities out of the way, I want to reflect and evaluate on my incredible opportunity to travel and train after being funded £500 by the The Pebble Trust. Originally, I wanted to use this opportunity to go and train with my mentor Jihene Gray, of Underground Dance Providers, Paris. However, due to Jihene picking up a last minute job I was forced to re-evaluate my idea, yet still utilize this opportunity to better my practice. I decided to focus on what I could do in London, with the vast array of different classes and workshops that are happening everyday I was bound to find something that I would enjoy and benefit from. I decided to return to my capoeira training – which I started during my second year of university – with Baris Yazar, a contre mestre based in South London, who first taught me capoeira at university. The first class I attended was a tough reminder of how long is takes to train the body in sync with this particular dance fight game. I also felt that capoeira would translate across other genres of my training such as Lofting in House dance and Contemporary dance, It was a no brainer really. But I digress, the first class I received a warm welcome from Baris and other fellows students, I enjoyed the class and was reminded why I was always so fasnicated and passionate about capoeira but like I said, it wasn’t easy. My body felt sluggish and slow compared to the other capoeristas in the class, but nonetheless, it takes time, effort and most of all patience. I returned to many more classes of Baris’s throughout the month and even though I haven’t seen a particular change in my mental and physical state as of yet, I feel like the passion for this dance has been reignited and can’t wait to continue and prosper in capoeira. I also attended Baris’s weekend workshop of Strength and flexibility, which he puts on every month. In this class he explores alternative and more holistic approaches to developing movement and also extend the range of motion. 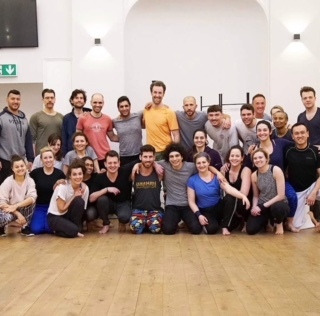 This particular workshop I loved, it was fresh and new and something I’ve never really experienced before and a very different set-up to his usual capoeira class on a Monday night. it made realize the areas in which I feel limited in my body and what weaknesses need to be focused on. Next was my workshop with Charlie Blair, which was incredible. Charlie helped me understand how to break down certain foundations and movement essential to the House Dance style and how to incorporate it and it into my own practice. she is someone I’ve wanted to work with for a while and this opportunity allowed me to do so, her approach is logical and analytical yet thoughtful and precise, it has really helped me re-evaluate how to approach my own practice. 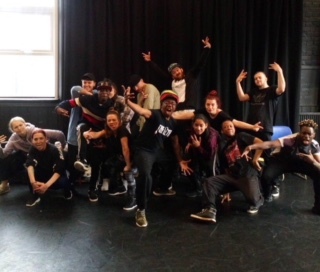 And finally, my workshop with Jonzi D. Exploring Hip Hop theatre techniques and how they can be applied. I was nervous for this workshop, as it was exploring role play and voiced work; something I’m not always comfortable doing but this was different. Jonzi D created a space where people could be vulnerable and honest even though the participants didn’t know one another. it was thoughtful, powerful and refreshing to hear. What I took away from Jonzi D was more than the techniques he showed us, it was about how to fully believe in your own practice regardless of what people say or think about it. This month, has opened up so many opportunities about myself as an individual and as an artist. I think in hindsight I didn’t take full advantage of what was given to me during this opportunity even though my original plans did fall through. nevertheless, I’m extremely grateful for what Pebble trust have done for me and the experiences I did have were long lasting and will stay with me for years to come. 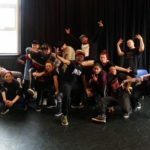 I would love to get involved with South East Dance again and what the incredible things they do for artists in Sussex.